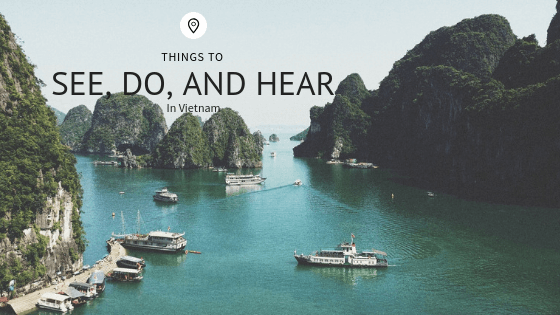 Vietnam is chalk full of the gorgeous countryside, delicious food, and fascinating culture. Below is a list of the most memorable places and experiences from travelers all over the world. The surrounding countryside of Ninh Binh is breathtaking, the physical city not so much. The countryside of Ninh Binh will seduce you. Rent a bicycle and set out early morning to explore the karst limestone scenery. It is a wonderfully peaceful day of exploring villages, and having a picnic by the side of rice fields while watching the locals work. You can feel relaxed watching the birds, feeling at peace. Sign up for a free tour with Hanoi Kids, an organization that pairs travelers with students learning English. It’s fantastic because it is free, and you will get a local’s perspective on the city, culture, and cuisine. On the tour, you get a view on the Hanoi life, their ambitions and the Korean pop stars they like over lunch in their favorite cafe. You can set the pace and then they give you tips for making the most of your time in the city. The tour itself is free, apart from any entrance fees. Vietnam is a food lover’s paradise. It is packed with countless tasty and affordable options. There are a vast amount of things and places to eat, especially in the big cities, can be overwhelming. A tour guide is a perfect way to experience it all in Hanoi. A tour guide will take you to their favorite places in the city and order the food for you to enjoy. The tour guide will also teach you how the food should be eaten and which sauces go best with each dish and the correct dipping order. Dai Lanh beach lays 80km north of Nha Trang, where the lush Annamite mountains meet the ocean, it is gorgeous. Once you arrive, hire a scooter and make your way down the 30km-long Hon Gom sandbar. While on the scooter, you can ride past the sand dunes and over the sand-smeared tarmac of a new road leading to the Vuon Xoai restaurant in the floating hamlet of Son Dung. You can dive off the pontoon boat, go on a tour of the village by boat, and dine and sleep under the stars in a hammock.